Railpictures.ca - William J. Madden photo, Dan Dell'Unto coll. Photo: The Burlington Canal Lift Bridge looms high in the background over GO Transit GP40-2W 9810, seen stopped for photos on a fantrip special along CN’s Beach Branch halfway between Burlington and Stoney Creek, at MP 4.9 “Hargrove” just south of the bridge.This fantrip special was run with three single-level Hawker Siddeley coaches, APCU 9861 at one end (rebuilt ex-Ontario Northland FP7 1512) and GP40-2W 9810 on the other. The APCU and GP40-2W were less than a year old at the time, having been acquired for the new Georgetown line service that began operations that April. This fantrip was part of a series of three* held on July 5th to 7th in the Toronto area, and from what I’ve been able to gather, photo stops included Stewarttown, Hamilton (James St.) station, Burlington Beach (here) and Burlington station.The old Beach Branch, or more formally known as CN’s Beach Subdivision, was originally constructed across Burlington Bay by the Hamilton & Northwestern Railway in 1876, running from Burlington to Stoney Creek. A notable feature along the line was this lift bridge, that let rail and road traffic cross Burlington Canal while also permitting ships entry into Burlington Bay and Hamilton Harbour. Queen Elizabeth Way freeway construction in 1974-75 severed the 7.8 mile line near the south end (still shown as a full line in the October 1974 CN ETT) and the line then operated as a 7.0 mile spur from Burlington for a few years until it was abandoned in 1981. CN ripped up most of the line in 1983, leaving short stubs at both ends to serve local rail customers. The single track across the lift bridge was removed and replaced by two more lanes of traffic during this period.William J. Madden photo, Dan Dell’Unto collection slide. * Fantrips:July 5th 1974: Toronto trolleybus fantrip with TTC Flyer E700′s 9265 & 9312.July 6th 1974: GO fantrip with GO GP40-2W 9810, three cars & APCU 9861 – with stops including Stewarttown, Hamilton Station, Burlington Beach, Burlington station.July 7th 1974: TTC PCC fantrip with cars 4384, 4742 & 4750. | Railpictures.ca – Canadian Railway Photography – photographie ferroviaire Canadienne. Copyright Notice: This image ©William J. Madden photo, Dan Dell'Unto coll. all rights reserved. 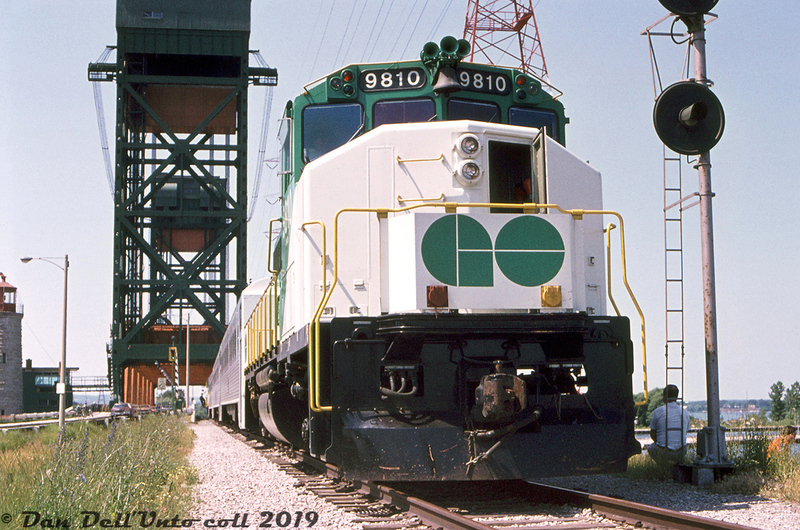 Caption: The Burlington Canal Lift Bridge looms high in the background over GO Transit GP40-2W 9810, seen stopped for photos on a fantrip special along CN's Beach Branch halfway between Burlington and Stoney Creek, at MP 4.9 "Hargrove" just south of the bridge. This fantrip special was run with three single-level Hawker Siddeley coaches, APCU 9861 at one end (rebuilt ex-Ontario Northland FP7 1512) and GP40-2W 9810 on the other. The APCU and GP40-2W were less than a year old at the time, having been acquired for the new Georgetown line service that began operations that April. This fantrip was part of a series of three* held on July 5th to 7th in the Toronto area, and from what I've been able to gather, photo stops included Stewarttown, Hamilton (James St.) station, Burlington Beach (here) and Burlington station. The old Beach Branch, or more formally known as CN's Beach Subdivision, was originally constructed across Burlington Bay by the Hamilton & Northwestern Railway in 1876, running from Burlington to Stoney Creek. A notable feature along the line was this lift bridge, that let rail and road traffic cross Burlington Canal while also permitting ships entry into Burlington Bay and Hamilton Harbour. Queen Elizabeth Way freeway construction in 1974-75 severed the 7.8 mile line near the south end (still shown as a full line in the October 1974 CN ETT) and the line then operated as a 7.0 mile spur from Burlington for a few years until it was abandoned in 1981. CN ripped up most of the line in 1983, leaving short stubs at both ends to serve local rail customers. The single track across the lift bridge was removed and replaced by two more lanes of traffic during this period. William J. Madden photo, Dan Dell'Unto collection slide. July 5th 1974: Toronto trolleybus fantrip with TTC Flyer E700's 9265 & 9312. July 6th 1974: GO fantrip with GO GP40-2W 9810, three cars & APCU 9861 - with stops including Stewarttown, Hamilton Station, Burlington Beach, Burlington station. July 7th 1974: TTC PCC fantrip with cars 4384, 4742 & 4750. The old wooden namesign “Hargrove” was on the other side right across the bridge. Fantastic image! So few shots from here before it was abandoned.